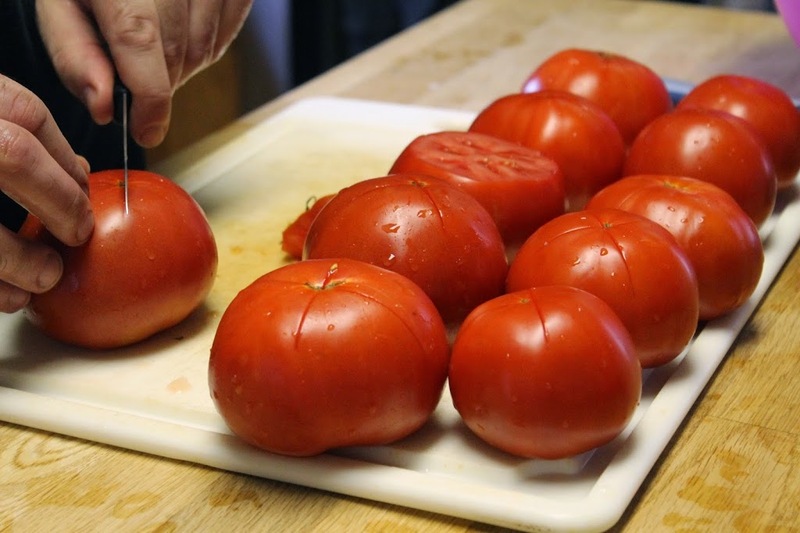 As you might have read, we’re sort of inundated with tomatoes right now. A friend called it an infestation, and she’s not far off. We planted several different varieties from seedlings we got through Penn’s Corner’s Online Farm Stand. San Marzanos and Romas, plus a few heirlooms like Black Cherry, Garden Peach and Cherokee Purple. 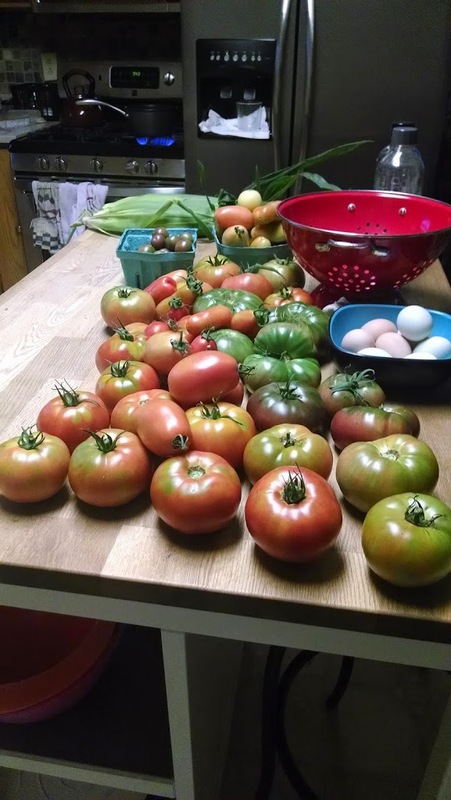 We’ve never had a really good tomato harvest since we started gardening. Last year late blight got pretty much all of them, so when we wanted to can tomatoes or salsa, we had to buy a case of ripe ones from our CSA. 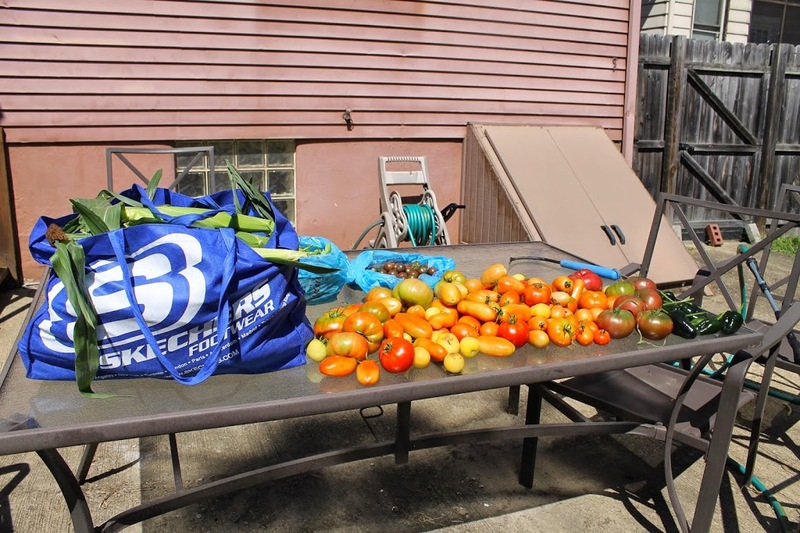 The photo above represents a small fraction of what was LEFT after our fourth picking, and a day of canning whole, quartered tomatoes and salsa. So far, we have frozen close to 20 pounds, and made quarts of fresh sauce to freeze. 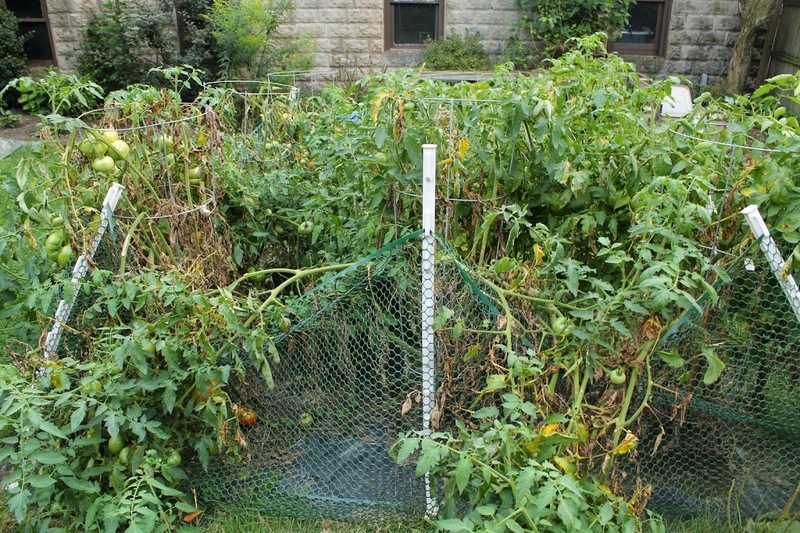 We’e also given away at least 15 pounds, when we had ripe ones that needed a home before they ended up in the compost. And now I write this at a large table full of more tomatoes. This is what we picked yesterday. I’ll talk about the giant bag of corn and the big bag of green beans hiding behind it later this week. 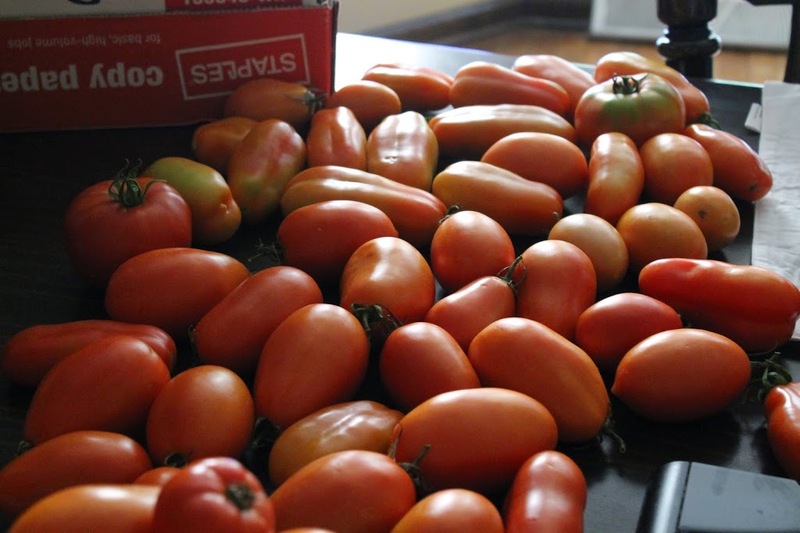 But ALL those tomatoes came inside and now live on my dining room table. 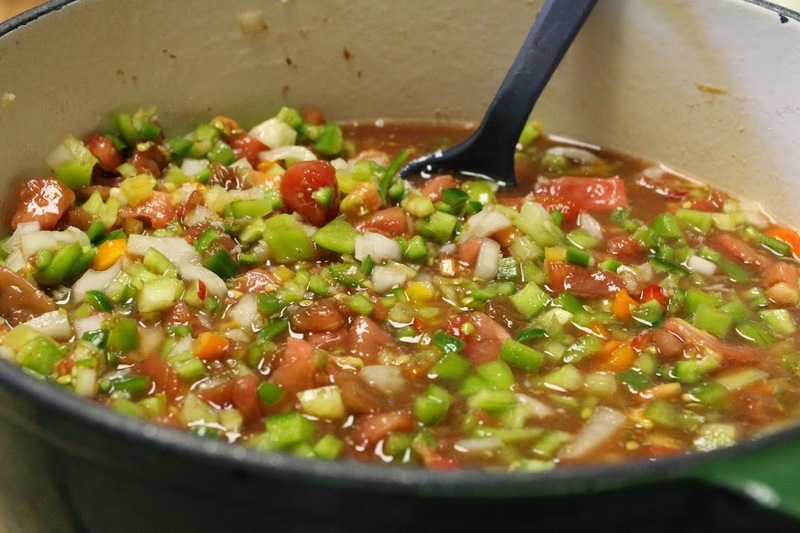 I didn’t take a ton of photos of the canning process, because I’ve already done larger, more in-depth posts on whole tomato canning and salsa canning. Plus, it was a long day in a hot kitchen on tired legs (after a bad half marathon on Saturday – don’t even get me started, ugh). And, I was feeling frustrated. I always like to talk here about how there’s room in your life for some DIY and homesteading activities if you have a full-time job and a city commute, like both of us do. 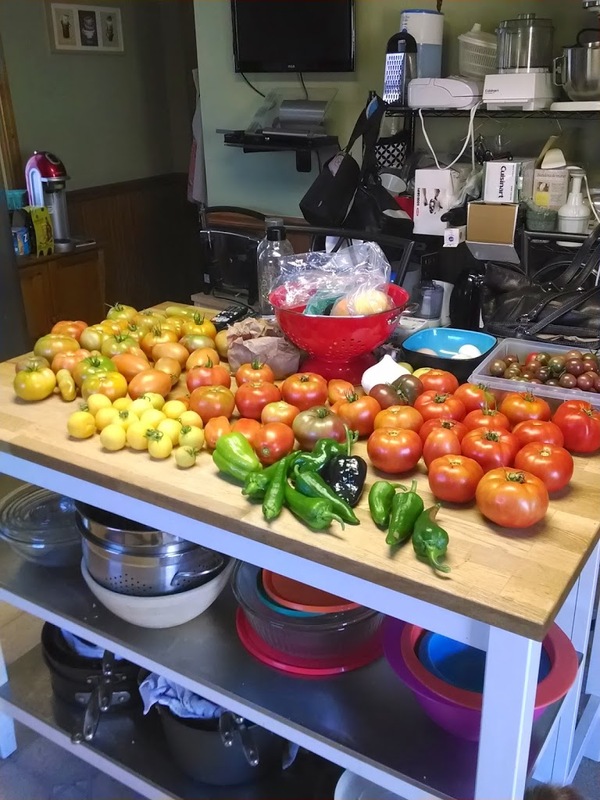 We manage to keep a garden and do some canning and freezing, and it might seem like we’re able to do a lot. But we absolutely can’t do everything we want to do. Not even a fraction. There are just not enough hours in the week. And tomatoes don’t stop ripening just to accommodate your marathon training, your 7 hours a week of commuting, or your 45 hours a week of being an office drone. They just keep coming. The relentless, delicious buggers. Yes, I do envy people who have some arrangement that lets them do major gardening and food harvesting and preserving, whatever that may be. Not because I begrudge them the time, but because it’s one of my passions. I really do love it. The long, hot day in the kitchen on my calloused feet wouldn’t be so hard if I knew I could keep going in the morning instead of getting in my car at 6 a.m. and not returning until at least 5. It’s not even easy to donate to food pantries when you work full time. I missed the one weekend donation window because of my race, and the daytime drop-offs are during my work day. I have one potential place left that might be able to take some. Fingers crossed. But for now, who wants some tomatoes? 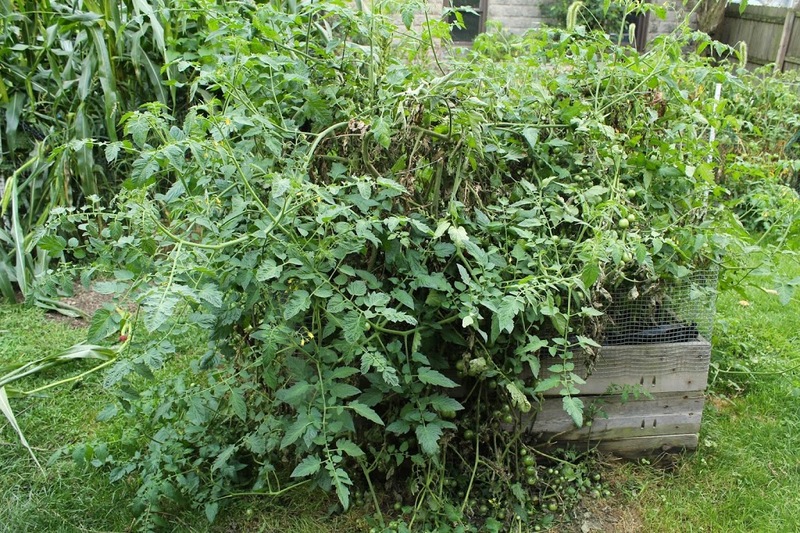 Really, this post should be subtitled “The Tomato Jungle” because that’s pretty much what we have going on right now. It’s kind of a hot mess in our backyard right now. But let’s start with a few things that aren’t tomatoes. 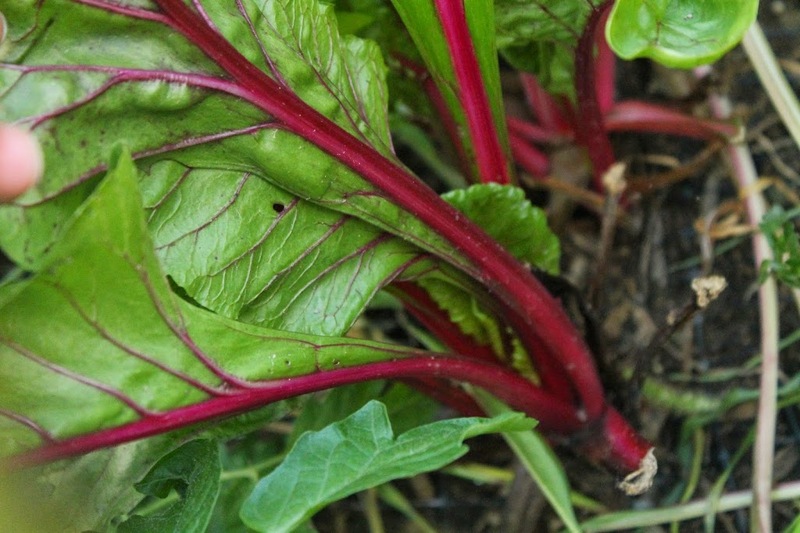 After the great chard harvest of 2014, the plants are rebounding and we’re getting another batch. I hope this lasts into the fall. Beans need a final pick, but I haven’t been able to get to them because of this situation. 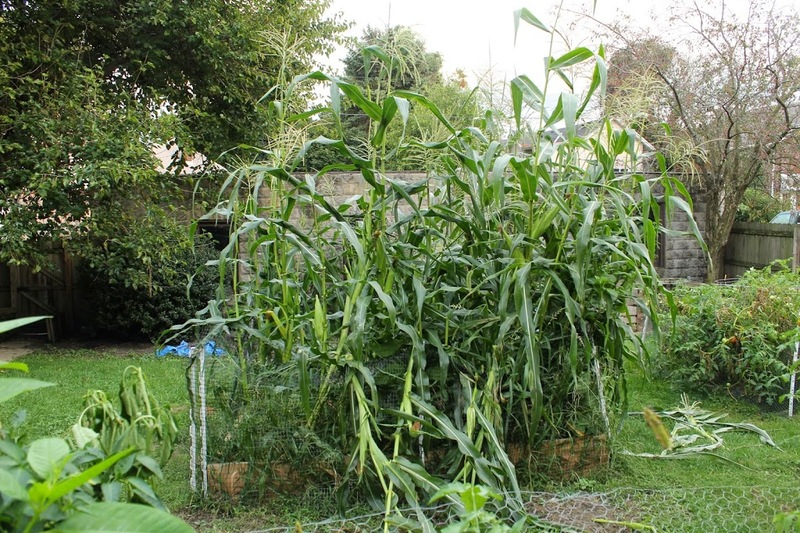 Some of the stalks are breaking and dying off, which is probably due to their weight. Not pretty or garden blog worthy, surely, but I can’t complain about how much these plants have produced. 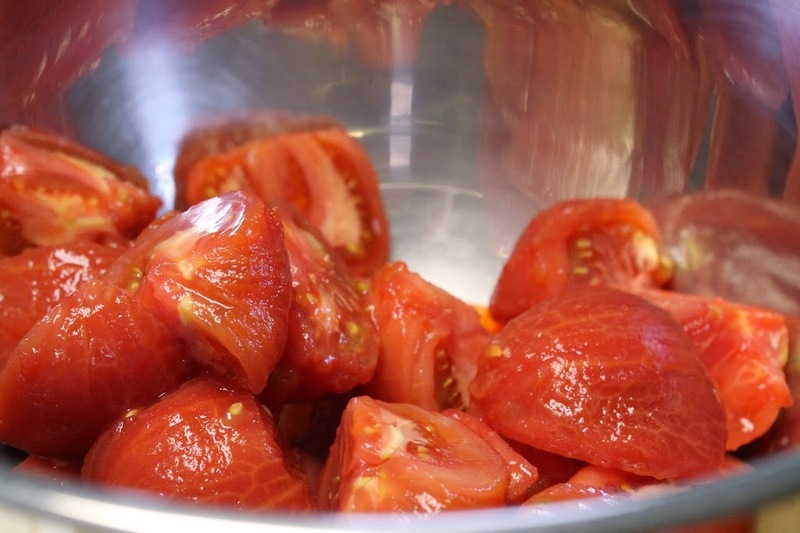 So far, we’ve been freezing tomatoes to keep up with them. 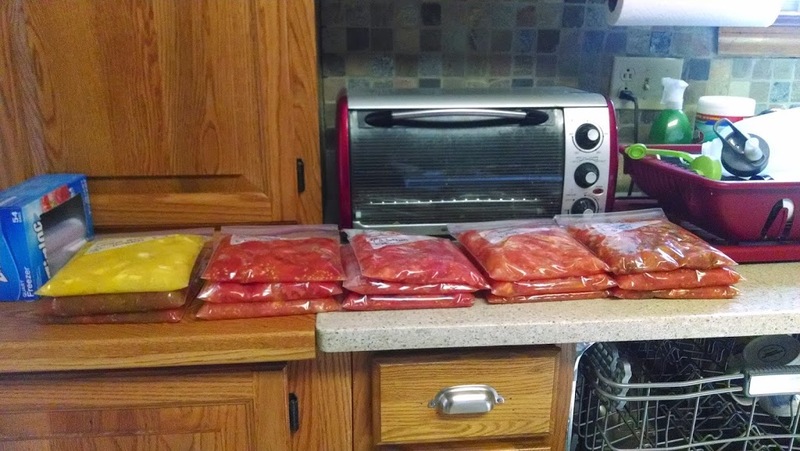 I’ll do a post on that at some point, too, but from just a fraction of the tomatoes in that first photo of the on our island, I got 15 pounds of frozen tomatoes, ready for sauce and chili. 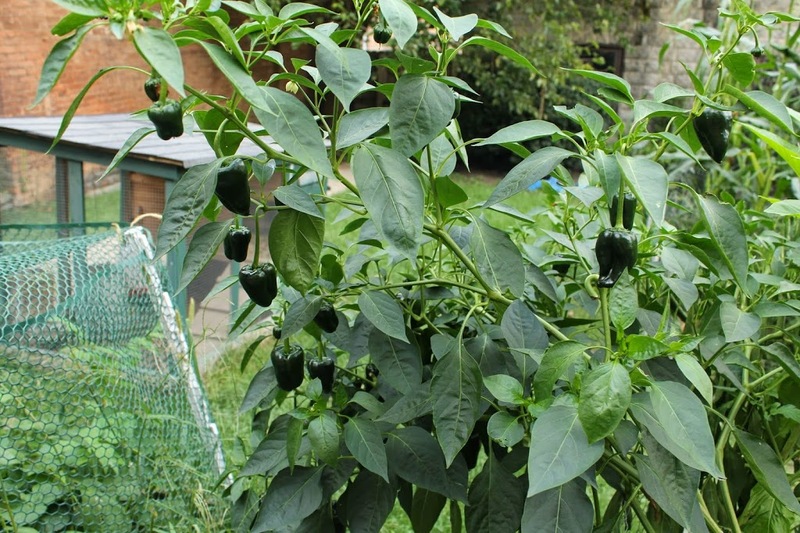 I hope to can at least a batch of them this year, if not two, and possibly do some salsa as well, depending on how the peppers look. We’ve done more freezing than canning this year, which is weird, but at the same time, we’ve had less available weekend time due to triathlon and marathon training. We’ve been able to preserve most of the tomatoes from the garden thus far. I just hope I can keep up as we get the final deluge! How’s your garden doing? 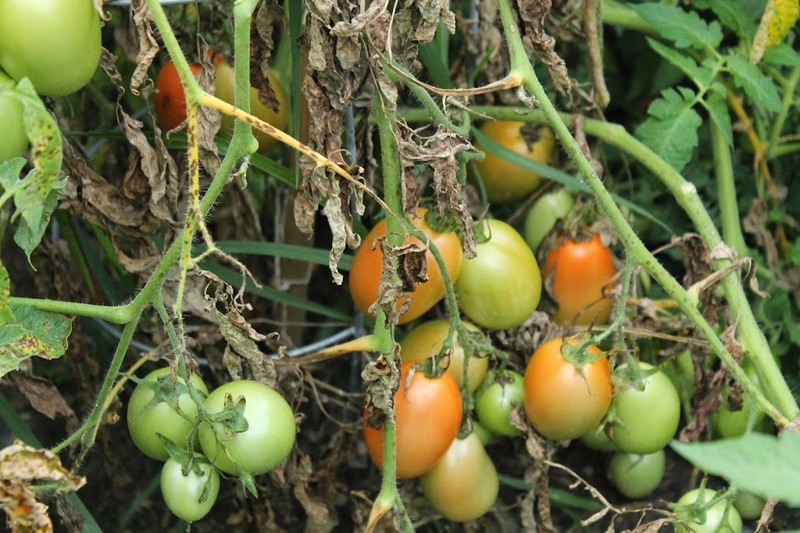 Are you still harvesting or ready for fall?